Family engagement programs that are implemented with intensity and duration can make a difference for families and can support children’s academic achievement. For 30 years, the National Center for Families Learning (NCFL) has developed programs for families that produce results. 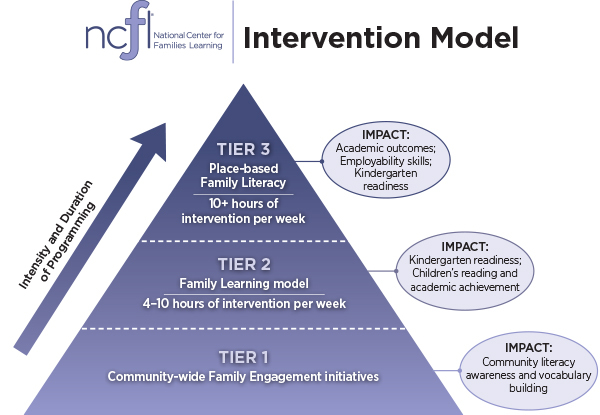 NCFL recently shared this unique approach to family engagement through a three-tiered model designed to meet families where they are and lift them out of poverty. This model is explained in NCFL’s most recent white paper, Defining Our Work: Families Learning Together. Within the paper, NCFL positions its signature family engagement models as the most successful in equipping families for future success. Three decades of listening to families and practitioners, as well as paying attention to the results of researchers and program evaluations, has culminated in this three-tiered approach that includes family literacy, family learning, and family engagement models of intervention. Outcomes of these models include increased school attendance, improved reading scores for children, and parents who are more engaged with their children’s educational processes, their schools, and their communities. Written by NCFL education leadership, the paper shares an overview of the rationale behind the NCFL models. It begins by examining the definition of family literacy from the NCFL perspective, noting its alignment with the federal government’s definition. The white paper provides further delineation of the family literacy and family learning tiers, examining their adult education, early childhood education (preschool through grade three), Parent Time, and Parent and Child Together (PACT) Time® components in-depth. Additionally, the paper remarks on Family Service Learning, which has been recently introduced into both models with success. Interwoven within the paper is a brief account of NCFL’s history along with discussion on the impact of increased social capital. The entire white paper is available as a free PDF download, Defining Our Work: Families Learning Together.